The installation or repair of boat ramps and docks requires dry work environments for the project to proceed in a safe, timely, and efficient manner. Whether the need is to dam, divert, or de-water, Dam-It Dams rapidly deployed and environmentally friendly water inflated barriers offer a flexible and compact cofferdam to meet virtually every project need. Whether in dry surface areas, static water, or dynamic movement water areas, we provide the equipment to best keep you and your project safe. Below are a few examples of our product and how it can provide a dry work environment for boat ramp repairs and installations. Project Description: Cofferdam was used to de-water the work site to allow for a new concrete boat ramp to be poured. Project Description: A Dam-It Dams cofferdam was used to de-water the work site to allow for a new concrete boat ramp to be poured. 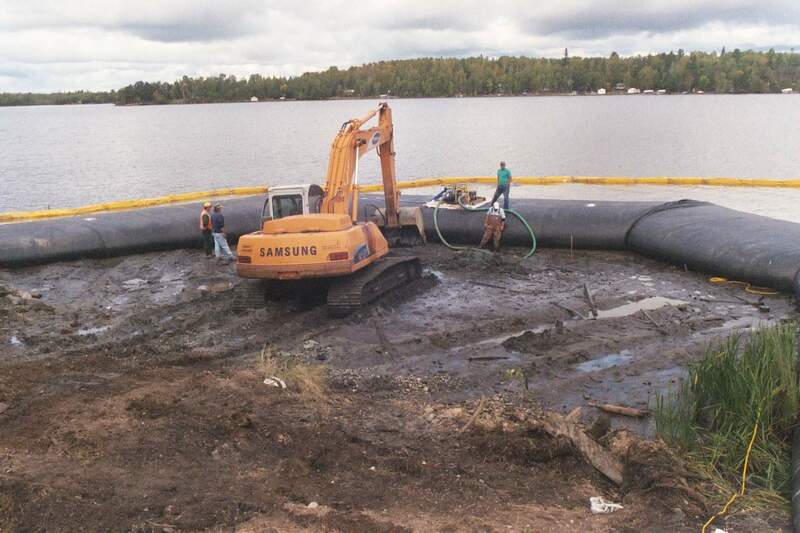 Project Description: Dam-It Dams provided a temporary water-filled cofferdam that was needed by the Minnesota DNR to construct a new boat ramp that would allow access by its seaplane to Lake Vermillion.